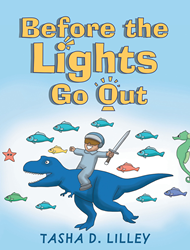 Recent release “Before the Lights Go Out” from Page Publishing author Tasha D. Lilley is an enjoyable story that delves into the mind of kids and attempts to explain their playful side before rest. Tasha D. Lilley, a mother, wife, and active duty service member with sixteen years’ experience in the human resource management career field, as well as a recipient of an associate’s degree in human resource management from the Community College of the Air Force and a bachelor of applied science degree in human services from Wayland Baptist University, has completed her new book “Before the Lights Go Out”: a highly charming tale of a young boy’s before-sleep adventures through magical terrains and characters brought about by his amazing imagination. Published by New York City-based Page Publishing, Tasha D. Lilley’s light-hearted tale is a wonderful read that parents will find endearingly relatable and heartwarming. Readers who wish to experience this fun work can purchase “Before the Lights Go Out” at bookstores everywhere, or online at the Apple iTunes store, Amazon, Google Play, or Barnes and Noble.